1Choose the File→Utilities→Condense Data command. 2Select the Transactions Before a Specific Date radio button. 3Specify the Remove Transactions Before date. To specify the date before which closed transactions should be removed, enter the date in the date box. If you want to condense the file by removing transactions on or before December 31, 2012, for example, enter 1/1/2013 in the date box. Note, however, that you don’t need to feel compulsive about removing a bunch of closed transactions. You remove closed transactions only if your QuickBooks company file is getting too big. You can easily work with a QuickBooks company file that’s 25MB, 50MB, or even 100MB (megabytes). Although typically, you condense a QuickBooks file by removing old, closed transactions, the Condense command also creates files without transactions and files with only a specified data range of transactions. To create a file that holds lists and preferences but no transactions, click the All Transactions radio button. By the way, you might use the All Transactions option to build a nearly empty file you could reuse (such as for training). To create a QuickBooks file that holds a specified range of transactions, click the Transactions Outside of Range radio button and then enter the dates that bookend the range using the Before and After boxes. 4Click Next when you finish specifying which transactions QuickBooks should remove. 5Specify how transactions should be summarized. If you will summarize historical transactions, QuickBooks uses a second Condense Data dialog box to ask how it would summarize historical data: with a single summary journal entry, with monthly summary journal entries, or no summary at all. Select the radio button that corresponds to the summarization approach you want. (Usually, you would probably use the second option listed — that of having QuickBooks create monthly summary journal entries — so you can still generate meaningful monthly reports. 6Click Next when you finish specifying how QuickBooks should summarize transactions. 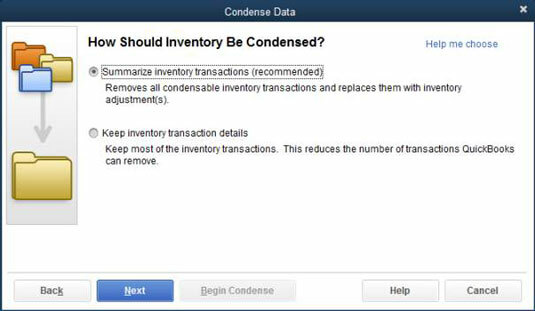 7Specify how inventory transactions should be condensed, and click Next. When you click Next, you continue to the fourth Condense Data dialog box (not shown), which asks which transactions should considered closed. 8Specify which transactions should be removed, and click Next. 9Specify any list cleanup that should occur, and click Next. 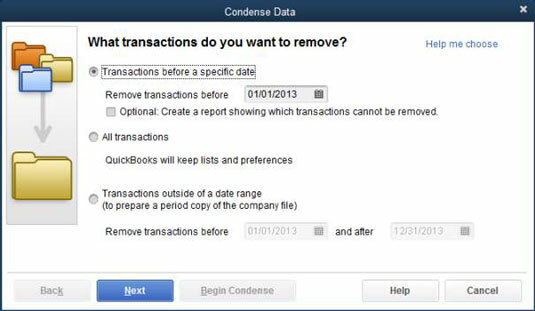 Use the fifth Condense Data dialog box to tell QuickBooks that in addition to removing old closed transactions, it should clean up some of the lists. 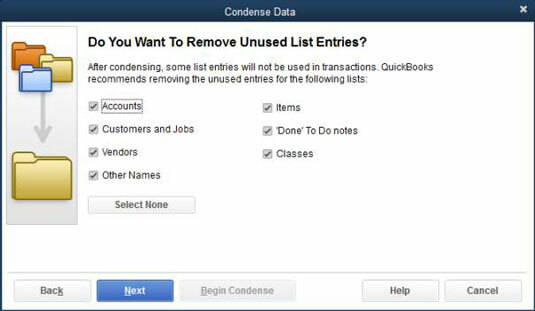 You can select check boxes on the Condense Data dialog box that tell QuickBooks to remove unused accounts, unused customers, unused vendors, and so forth. By cleaning up your list through the removal of unused list items, you not only reduce the size of the company file, but also make it easier for people to work with the list. 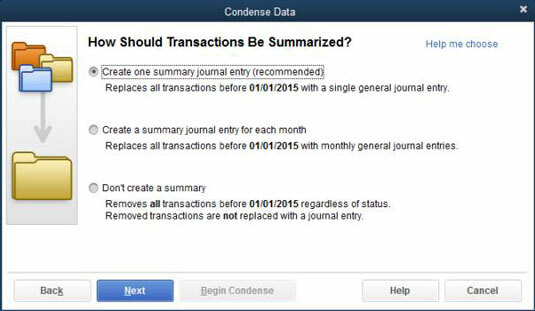 When you click Next, QuickBooks displays the sixth page of the Condense Data dialog box. 10Confirm your condensing and archiving operation. After you describe how you want QuickBooks to archive and condense the company file, QuickBooks displays the sixth Condense Data dialog box. The dialog box tells you that the archival process begins with QuickBooks making a copy of the data file and that the condensation operation may take several minutes or even several hours to complete. 12Back up the data file when prompted. 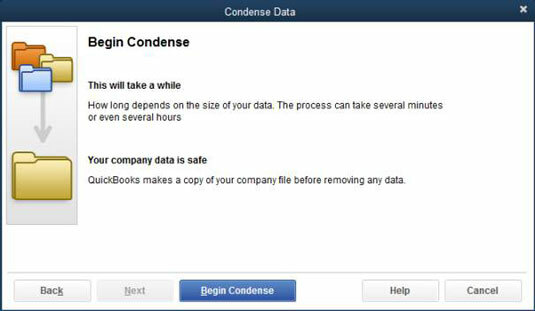 At the very beginning of the condense process, QuickBooks prompts you to back up the QuickBooks company file. Backing up the QuickBooks company file as part of a condense operation works the same as backing up the QuickBooks company file at any other time. After you back up the QuickBooks company file, QuickBooks saves an archive copy of the company file and then cleans up the working version of the company file by using your instructions. The cleanup process may take only a few minutes, or it may take several hours if your file is very large.